They've got a few weeks. But if federal officials can't get the new online insurance marketplace running smoothly by mid-November, the problems plaguing the three-week-old website could become a far bigger threat to the success of the health law, hampering enrollment and fueling opponents' calls to delay implementation, analysts say. "The system needs to be operating reasonably efficiently — I'm not saying flawlessly — before the middle of November," says Sandy Praeger, the insurance commissioner of Kansas, one of the 36 states relying on the federal marketplace because legislators there opted not to create their own state-based market. On Monday, President Obama addressed the problems directly for the first time. "No one is more frustrated than me," he said, promising that technology experts from around the country were working with the administration "to get this working better, faster, sooner." Still, he did not offer details about the scope of the problems, a timeline for the repairs, or the number of people who have successfully enrolled out of the more than 19 million visitors to the federal site. The stakes are huge — and not just because of public opinion, but to ensure broad insurance pools, which are key to the law's long-term success..."If we're not seeing a substantial improvement in the next two or three weeks, we'll be in a bad place," said Dan Schuyler, director of exchange technology at Leavitt Partners, a consulting firm. "We're already behind the curve in getting to that 7 million mark." Delay the mandate for months and you’re all but guaranteeing that healthy uninsured people won’t sign up soon, which means insurers won’t have the new revenue they were banking on to cover sick people’s preexisting conditions. Voila — you’ve created the conditions for an industry death spiral. Democrats know it too, just like they also know that they’re not getting anything like single-payer through Congress so long as there’s a Republican majority in the House. So they have no choice but to oppose Rubio’s bill and defeat it in the Senate, even though doing so will make for terrible politics. There are lots and lots and lots of things the public doesn’t understand about ObamaCare, but one thing everyone understands is that it’s unfair to punish people for not doing something the government’s made it all but impossible for them to do. Rubio’s bill essentially forces Democrats to argue that it is fair somehow in the name of keeping the mandate in effect. Days before the launch of President Obama’s online health ­insurance marketplace, government officials and contractors tested a key part of the Web site to see whether it could handle tens of thousands of consumers at the same time. It crashed after a simulation in which just a few hundred people tried to log on simultaneously. Despite the failed test, federal health officials plowed ahead. When the Web site went live Oct. 1, it locked up shortly after midnight as about 2,000 users attempted to complete the first step, according to two people familiar with the project. They tested the system with a "few hundred" simultaneous users, it failed, yet they still launched the site. Astounding. They've spent millions promoting a website and roll-out date that they knew wouldn't work, and they continue to do so. Administration allies are desperately trying to pawn this stink-bomb off onto the private sector contractors, but that doesn't fly either. The government chose to act as lead contractor (despite having minimal expertise), hand-selected companies to work with, and avoided seeking additional outside help in order to avoid a political embarrassment. Also, the contractors say they issued one internal warning after another, all of which were ignored. And here we are. 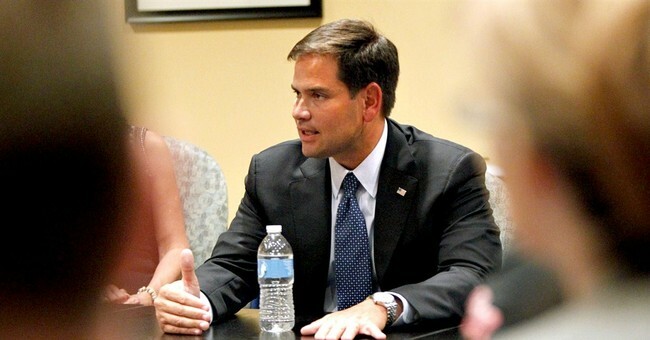 Let's hear it, Democrats: Why is Marco Rubio's bill unacceptable?